This article is about all Orthodox jurisdictions of Greek cultural heritage. 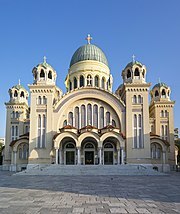 For the Orthodox Church in Greece, see Church of Greece. The name Greek Orthodox Church (Greek: Ἑλληνορθόδοξη Ἑκκλησία, Ellinorthódoxi Ekklisía, IPA: [elinorˈθoðoksi ekliˈsia]), or Greek Orthodoxy, is a term referring to the body of several Churches within the larger communion of Eastern Orthodox Christianity, whose liturgy is or was traditionally conducted in Koine Greek, the original language of the Septuagint and the New Testament, and whose history, traditions, and theology are rooted in the early Church Fathers and the culture of the Byzantine Empire. Greek Orthodox Christianity has also traditionally placed heavy emphasis and awarded high prestige to traditions of Eastern Orthodox monasticism and asceticism, with origins in Early Christianity in the Near East and in Byzantine Anatolia. Historically, the term "Greek Orthodox" has also been used to describe all Eastern Orthodox Churches in general, since "Greek" in "Greek Orthodox" can refer to the heritage of the Byzantine Empire. During the first eight centuries of Christian history, most major intellectual, cultural, and social developments in the Christian Church took place within the Empire or in the sphere of its influence, where the Greek language was widely spoken and used for most theological writings. Over time, most parts of the liturgy, traditions, and practices of the church of Constantinople were adopted by all, and still provide the basic patterns of contemporary Orthodoxy. Thus, the Eastern Church came to be called "Greek" Orthodox in the same way that the Western Church is called "Roman" Catholic. However, the appellation "Greek" was abandoned by the Slavic and other Eastern Orthodox churches in connection with their peoples' national awakenings, from as early as the 10th century A.D. Thus, today it is generally only those churches that are most closely tied to Greek or Byzantine culture that are called "Greek Orthodox". The Greek Orthodox churches are descended from churches which the Apostles founded in the Balkans and the Middle East during the first century A.D., and they maintain many traditions practiced in the ancient Church. 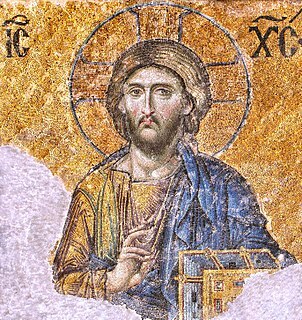 Orthodox Churches, unlike the Catholic Church, have no single Supreme Pontiff, or Bishop (see also: Pontifex maximus), and hold the belief that Christ is the head of the Church. However, they are each governed by a committee of Bishops, called the Holy Synod, with one central Bishop holding the honorary title of "first among equals". Greek Orthodox Churches are united in communion with each other, as well as with the other Eastern Orthodox Churches. The Orthodox hold a common doctrine and a common form of worship, and they see themselves not as separate Churches but as administrative units of one single Church. They are notable for their extensive tradition of iconography (see also: Byzantine art), for their veneration of the Mother of God and the Saints, and for their use of the Divine Liturgy on Sundays, which is a standardized worship service dating back to the fourth century A.D. in its current form. The most commonly used Divine Liturgy of the Orthodox Church was written by Saint John Chrysostom (347–407 A.D.). Others are attributed to St. Basil the Great, St. James, the Brother of God and St. Gregory the Dialogist. The current territory of the Greek Orthodox Churches more or less covers the areas in the Balkans, Anatolia, and the Eastern Mediterranean that used to be a part of the Byzantine Empire. The majority of Greek Orthodox Christians live within Greece and elsewhere in the southern Balkans (especially in Albania), but also in Jordan, the Occupied Palestinian territories, Iraq, Syria, Lebanon, Cyprus, Anatolia, European Turkey, and the South Caucasus. In addition, due to the large Greek diaspora, there are many Greek Orthodox Christians who live in North America and Australia. Orthodox Christians in Finland, who compose about 1% of the population, are also under the jurisdiction of a Greek Orthodox Church (the Ecumenical Patriarchate). There are also many Greek Orthodox Christians, with origins dating back to the Byzantine and Ottoman periods, who are of Arabic-speaking or mixed Greek and Arabic-speaking ancestry and live in southern Turkey, Israel, Palestine, Iraq, Syria, Lebanon, Jordan, and Egypt. They attend churches which conduct their services in Arabic, the common language of most Greek Orthodox believers in the Levant, while at the same time maintaining elements of the Byzantine Greek cultural tradition. Ethnic Greeks in Russia and Greeks in Ukraine, as well as Pontic Greeks and Caucasus Greeks from the former Russian Transcaucasus, often consider themselves both Greek Orthodox and Russian Orthodox, which is consistent with the Orthodox faith (since Orthodoxy is the same across ethnic boundaries). Thus, they may attend services held in Old Russian and Old Church Slavonic, without this in any way undermining their Orthodox faith or distinct Greek ethnic identity. Over the centuries, these Pontic Greek-speaking Greek Orthodox communities have mixed through intermarriage in varying degrees with ethnic Russians and other Orthodox Christians from mainly Southern Russia, where most of them settled between the Middle Ages and early 19th century. The Albanian Orthodox Church also known as "Greek Orthodox Church of Albania" or "Church of Albania" led since the collapse of the former Stalinist régime by Archbishop Anastasios, a Greek national. The Church conducts its liturgy in Koine Greek in the areas of Albania populated by the ethnic Greek minority, alongside the use of Albanian throughout the country. ^ Argyropoulou, Christina (2015): Γλώσσα και εξουσία μέσα από ποικίλα κείμενα στην καθαρεύουσα και τη δημοτική μορφή της ελληνικής γλώσσας. Έρκυνα: Επιθεώρηση Εκπαιδευτικών 7: 52–69. ^ a b Millar, Fergus (2006). A Greek Roman Empire : power and belief under Theodosius II (408–450). University of California Press. p. 279 pages. ISBN 0-520-24703-5. ^ Janet Saltzman Chafetz; Helen Rose Ebaugh (18 October 2000). Religion and the New Immigrants: Continuities and Adaptations in Immigrant Congregations. AltaMira Press. p. 155. ISBN 978-0-7591-1712-9. Retrieved 2 September 2013. The distinctive characteristics of the Greek Orthodox Church are its sense of continuity with the ancient Church of Christ and the Apostles and its changelessness. The Orthodox church traces its existence, through the ordinatinon of Bishops. directly back to the Apostles and through them to Jesus. ^ Sally Bruyneel; Alan G. Padgett (2003). Introducing Christianity. Orbis Books. p. 7. ISBN 978-1-60833-134-5. Retrieved 2 September 2013. The Eastern Orthodox and the Roman Catholic Churches are the oldest with roots going back to the earliest Christian groups. ^ Benjamin Jerome Hubbard; John T. Hatfield; James A. Santucci (2007). An Educator's Classroom Guide to America's Religious Beliefs and Practices. Libraries Unlimited. p. 63. ISBN 978-1-59158-409-4. Retrieved 2 September 2013. The Orthodox Church traces its origins to the churches founded by the apostles in the Middle East and the Balkans in the first century. ^ Robert L. Plummer (6 March 2012). Journeys of Faith: Evangelicalism, Eastern Orthodoxy, Catholicism and Anglicanism. Zondervan. p. 128. ISBN 978-0-310-41671-5. Retrieved 2 September 2013. Catholicism holds that if a Church claims to be Christian, then it must be able to show that its leaders-its bishops and its presbyters (or priests)- are successors of the apostles. That is why the Catholic Church accepts Eastern Orthodox ordinations and sacraments as valid, even though Eastern Orthodoxy is not in full communion with Rome. ^ William A. Dyrness; Veli-Matti Kärkkäinen (25 September 2009). Global Dictionary of Theology: A Resource for the Worldwide Church. InterVarsity Press. p. 244. ISBN 978-0-8308-7811-6. Retrieved 2 September 2013. This connection is apparent through the historical succession of bishops of churches in a particular geographic locale and by fidelity to the teachings of the apostles (cf. Acts 2:42) and life as it developed in the patristic tradition and was articulated by the seven ecumenical councils. ^ a b Wendy Doniger (January 1999). Merriam-Webster's Encyclopedia of World Religions. Merriam-Webster. p. 309. ISBN 978-0-87779-044-0. Retrieved 2 September 2013. EASTERN ORTHODOXY, one of the major branches of CHRISTIANITY, characterized by its continuity with the apostolic church, its liturgy, and its territorial churches. 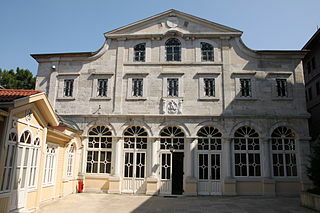 ^ "Ecumenical Patriarchate". Retrieved 2009-03-09. ^ "Archdiocese of Thyateira and Great Britain – Home". Retrieved 2009-03-11. ^ "The Holy Orthodox Archdiocese of Italy and Malta". Archived from the original on 2012-04-05. Retrieved 2009-03-11. ^ The Greek Orthodox Archdiocese of America should not be confused with the Orthodox Church in America, whose autocephaly – granted by the Russian Orthodox Church – is not recognized by the Ecumenical Patriarchate of Constantinople and many other churches of the Eastern Orthodox Communion. ^ "Greek Orthodox Archdiocese of Australia". Retrieved 2010-01-14. ^ "The official web site of Greek Orthodox Patriarchate of Alexandria and All Africa". Retrieved 2009-03-09. 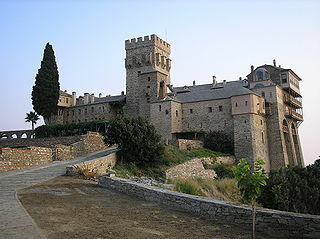 ^ "Greek Orthodox Patriarchate of Antioch and All the East". Retrieved 2019-04-03. ^ "Jerusalem Patriarchate". Archived from the original on 2012-04-05. Retrieved 2009-03-09. ^ "The Holy Monastery of the God-trodden Mount Sinai, Saint Catherine's Monastery". Retrieved 2009-03-09. 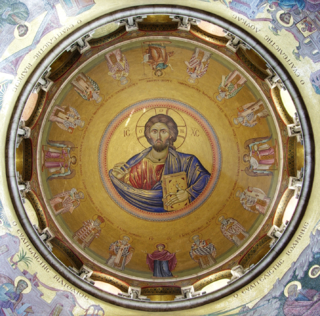 ^ "Ecclesia – The Web Site of the Church of Greece". Retrieved 2009-03-09. ^ "Church of Cyprus" (in Greek). Retrieved 2009-03-09. ^ "About Cyprus – Towns and Population". Government Web Portal – Areas of Interest. Government of Cyprus. Retrieved 19 January 2010. ^ "Cyprus". The World Factbook. Central Intelligence Agency. Retrieved 19 January 2010. ^ Roudometof, Victor (2002). Collective memory, national identity, and ethnic conflict. Greenwood Press. p. 179. the only remaining issues between the two sides concern the extent to which minority members should have equal rights with the rest of the Albanian citizens as well as issues of property and ecclesiastical autonomy for the Greek Orthodox Church of Albania. ^ Thornberry, Patrick (1987). Minorities and human rights law (1. publ. ed.). London: Minority Rights Group. p. 36. ISBN 9780946690480. ^ "Albanian church attack 'act of religious hatred'". WorldWide Religious News. Retrieved 12 June 2012. ^ "Archbishop Anastasios - Medical Diagnostical Centre - ZoomInfo.com". ZoomInfo. The Eastern Orthodox Church, like the Catholic Church, claims to be the One, Holy, Catholic and Apostolic Church. Autocephaly is the status of a hierarchical Christian Church whose head bishop does not report to any higher-ranking bishop. The term is primarily used in mostly all Eastern Christian denominations like Eastern Orthodox, Oriental Orthodox, and few Independent Catholic churches. The status has been also compared with that of the churches of the Anglican Communion. The Greek Orthodox Church of Antioch, also known as the Antiochian Orthodox Church, is an autocephalous Greek Orthodox Church within the wider communion of Eastern Orthodox Christianity. Headed by the Greek Orthodox Patriarch of Antioch, it considers itself the successor to the Christian community founded in Antioch by the Apostles Peter and Paul. Russian Orthodoxy is the body of several Churches within the larger communion of Eastern Orthodox Christianity, whose liturgy is or was traditionally conducted in Church Slavonic language. The Greek Orthodox Archdiocese of Italy and Malta and Exarchate of Southern Europe is a diocese of the Ecumenical Patriarchate of Constantinople with see in Venice. The diocese was created in 1991. The current Archbishop and Metropolitan is Gennadios Zervos. 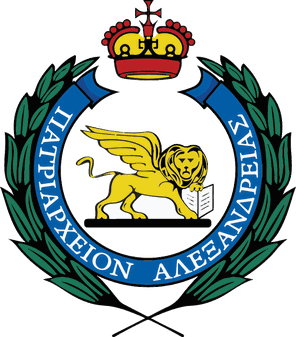 The Greek Orthodox Patriarchate of Alexandria and all Africa, also known as the Greek Orthodox Church of Alexandria, is an autocephalous patriarchate that is part of the Eastern Orthodox Church. Its seat is in Alexandria and it has canonical responsibility for the entire African continent. Christianity has been, historically a Middle Eastern religion with its origin in Judaism. Eastern Christianity refers collectively to the Christian traditions and churches which developed in the Middle East, Egypt, Asia Minor, the Far East, Balkans, Eastern Europe, Northeastern Africa and southern India over several centuries of religious antiquity. It is contrasted with Western Christianity which developed in Western Europe. As a historical definition the term relates to the earliest Christian communities and their long standing traditions that still exist. In AD 1453, the city of Constantinople, the capital and last stronghold of the Byzantine Empire, fell to the Ottoman Empire. By this time Egypt had been under Muslim control for some seven centuries. Jerusalem had been conquered by the Umayyad Muslims in 638, won back by Rome in 1099 under the First Crusade and then reconquered by Saladin's forces during the Siege of Jerusalem in 1187. It was conquered by the Ottomans in 1517. Orthodoxy, however, was very strong in Russia which had recently acquired an autocephalous status; and thus Moscow called itself the Third Rome, as the cultural heir of Constantinople. Under Ottoman rule, the Greek Orthodox Church acquired power as an autonomous millet. The ecumenical patriarch was the religious and administrative ruler of the entire "Greek Orthodox nation", which encompassed all the Eastern Orthodox subjects of the Empire. Oriental Orthodoxy is the fourth largest communion of Christian churches, with about 76 million members worldwide. As one of the oldest religious institutions in the world, it has played a prominent role in the history and culture of Armenia, Egypt, Eritrea, Ethiopia, Sudan and parts of the Middle East and India. An Eastern Christian communion of autocephalous churches, its bishops are equal by virtue of episcopal ordination, and its doctrines can be summarised in that the communion recognizes the validity of only the first three ecumenical councils.